There hasn’t been much time spent in Alexandria since the arrival of Alpha and the Whisperers, but the outside world came knocking during this week’s edition of The Walking Dead. 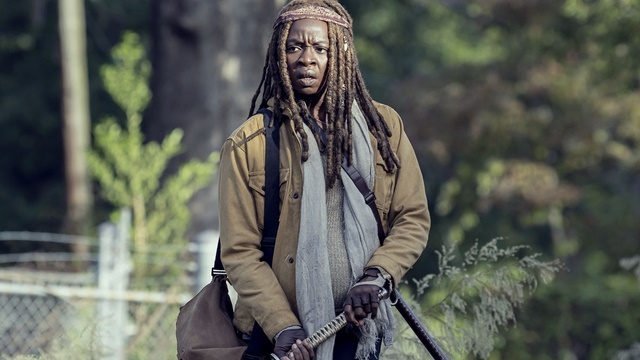 The Kingdom’ fair prep and Daryl’s rescue mission on behalf of Hilltop kept the other communities busy, but Michonne’s domain remained unfettered. At least from outside influences. Michonne’s anxiety and fear continued to haunt her and the community as a whole. Everyone has their demons, but the choice to leave them unconfronted left Alexandria hindered. The question as to why this happened has been a curiosity throughout the season. We got that chilling answer along with a new understanding as to why Michonne made herself, and Alexandria by association, an island amongst the dead. Daryl, Connie, Henry and Lydia arrive at Alexandria’s gates hoping to get Henry patched up following their fight with Beta’s hit squad. Aaron oozes worry as Michonne signals to open the gates. Daryl remains one of the few people Michonne trusts, and his presence is enough for her to give Lydia a shot inside their walls. Henry is stitched up in no time. Judith tries to get Daryl to stay but him and his crew have an obligation to get to the Kingdom. Not to mention the Whisperer threat beyond the gates. Judith remains confident they could defeat this latest foe, prompting Daryl to contemplate what Rick would do in the same spot. Daryl and his crew leave Alexandria for the Kingdom after a short rest. Daryl presses Michonne to talk to Judith about the past as he makes his way back into the wilds. Judith remains angry at Michonne during dinner, excusing herself early. Michonne later finds Judith and Rick’s revolver missing from her bedroom. Her first stop is Negan’s cell, but he has no clue where she could be. He criticizes Michonne for not being open and honest with Judith, pointing out the similarities between her outlook and Carl’s. Michonne returns home to find a note in Judith’s gun case informing her that Judith left Alexandria to help Daryl get to the Kingdom. She walks across a sealed manhole on her way to find her daughter. What Daryl wants Michonne to discuss with Judith is the series of events from years ago that caused her to seal herself off. Everything centers around a pregnant Michonne and the coincidental arrival of her old friend Jocelyn. Her and a number of children are welcoming into Alexandria and Jocelyn easily convinces Michonne to lead a group beyond the gates to find the rest of her children. They’re all brought back to Alexandria, with Jocelyn being the only adult amongst the group. She encourages Michonne to continue looking for Rick, but that’s where Jocelyn’s altruism ends. Her welcome is spoiled when she kidnaps multiple children, including Judith, steals food and medicine and escape through the manhole. Michonne and Daryl track the group to a school where they’re quickly captured and branded by the children under Jocelyn’s direction. She has dedicated herself to strengthening the next generation to survive by any means necessary. The two escape and Michonne’s pregnant belly is slashed before she kills Jocelyn in front of the children. She does her best to not hurt the children as they attack her, but the threat of Judith’s death forces her to slaughter a number of children to save her. Daryl emerges with blood on his blades as Michonne finds Judith. Michonne finds Judith taking out walkers in a field. Michonne sits her down and finally talks to her about the Jocelyn incident. 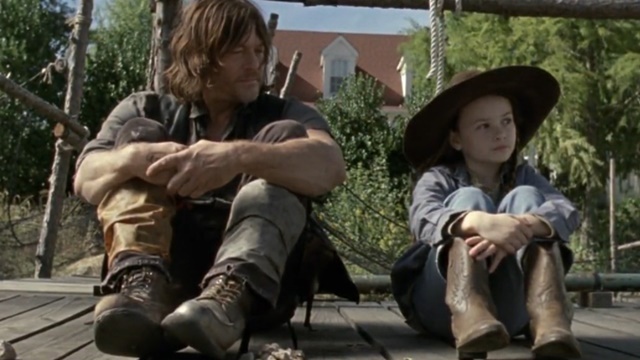 It seems that Judith remembers everything and understood Michonne’s actions. What she doesn’t understand is when the love for their fellow survivors and communities fell by the wayside. Michonne says that it didn’t but Alexandria’s isolation says otherwise. 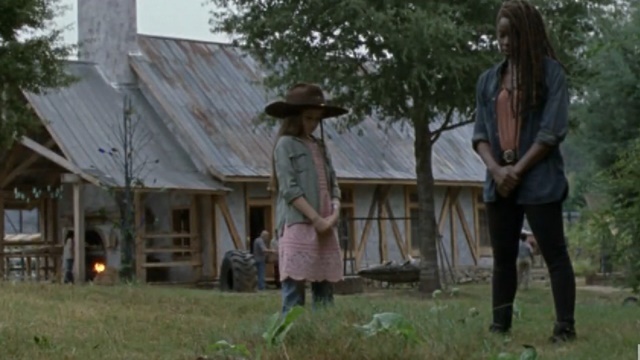 They gather around Carl’s grave as Michonne reflects on breaking her promise to never bury another child. She ultimately admits that Judith is right though. Their friends need them. The two take a carriage into the woods and pick up Daryl and crew. Next stop: the Kingdom. That might not be the best idea though. The Whisperers might not be onto Alexandria just yet, but they are aware of the Kingdom and at least two of their ranks have eyes on its gates. What do you think about The Walking Dead season 9 episode 14? Let us know in the comment section below!